Growers study tour 2017 starts today with a visit to North West Horticulture on Mt Vernon WA, looking at their production of 4M Hellebores as US partner for Josef Heuger and showing the new variety ‘Ice n’ Roses -Red’. 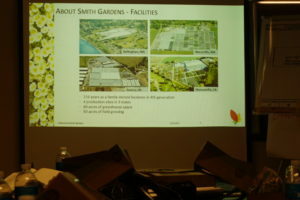 We heard today of the value of LEAN and how it is helping Skagit Gardens work on reducing the labour cost in their produce at their Mount Vernon facility. During a fascinating visit Mark Buckle spoke on the process they are using and Debbie who described their commercial and breeding connections as well as Sedum Tiles for green roofing and Dawn who spoke about their production management techniques. Skagit (rhymes with gadget!) is a wholesale greenhouse company located in the agricultural Skagit Valley http://www.skagitgardens.com/…/fuseacti…/home.home/index.htm , midway between Seattle, Washington and Vancouver, British Columbia. The mild maritime climate provides the ideal growing conditions for hardy perennials. They overwinter many plants outside to provide their customers with perennials that are vernalized and sure to bloom the first year in the garden. These plants are also better able to withstand the rigours of spring frost than are those that are grown in the greenhouses all winter. Skagit Gardens has two divisions—one is Finished Sales for retail-ready plants that are selected for INDEPENDENT GARDEN CENTRES & LANDSCAPERS, and the other is Skagit SuperStarts!™ for liners of seedlings and cuttings. These are sold to GROWERS & HORTICULTURAL BROKERS. Both divisions are dedicated to providing strong, healthy plants, whether old varieties or new, shipped efficiently and backed by outstanding customer service. 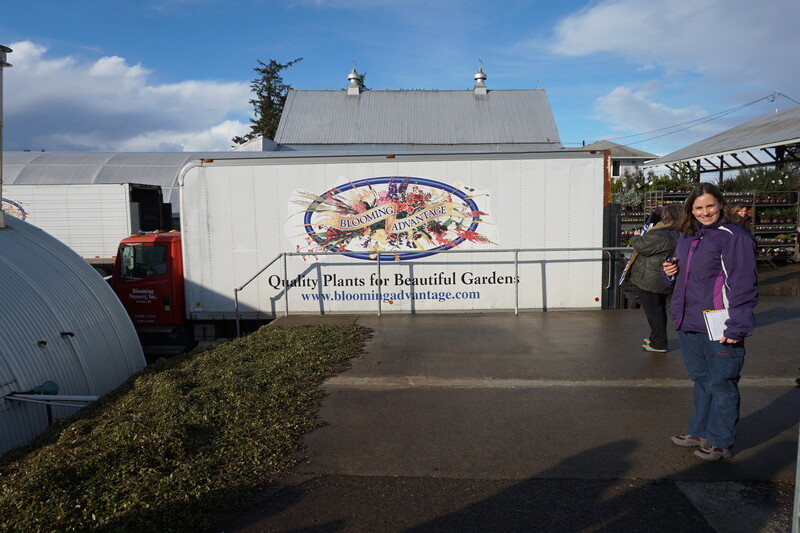 Skagit has recently merged with North West Horticulture which is serving the ‘BOX STORES’ with flowering plants. Together, they represent 600 acres of indoor and outdoor production in Washington state, east Washington and north California and employ up to 600 at peak periods. Bringing together the two companies is a great effort that is starting to bear results according to Mark. 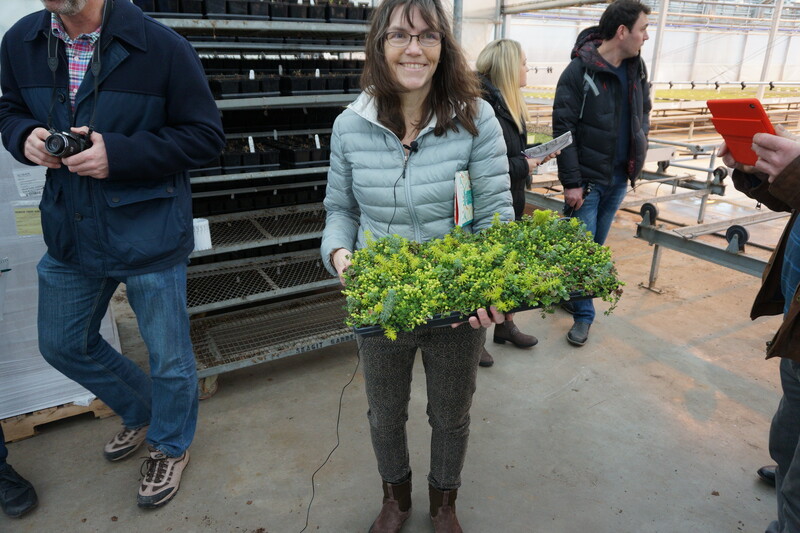 The Study Tour continues with a visit to the world famous breeders of perennial ornamentals- TERRA NOVA® Nurseries in Canby OR, just a little way over the border with Washington. 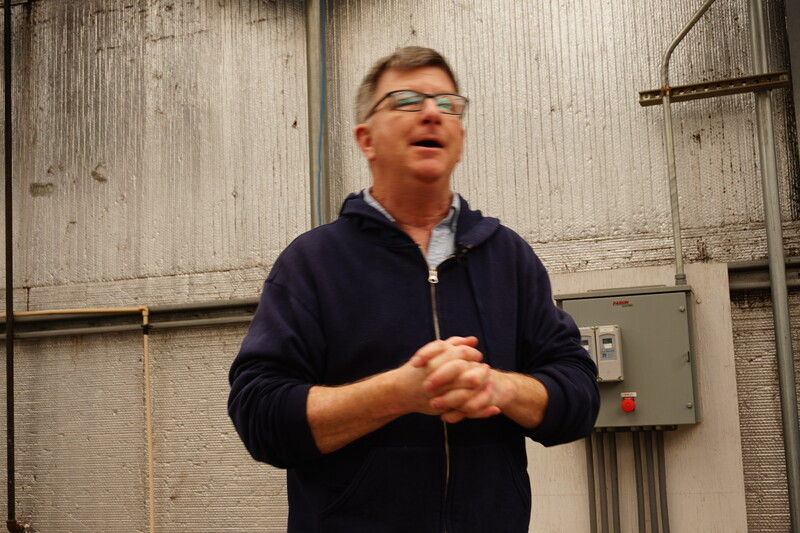 We were greeted by the ebullient Chuck Pavlich who entertained and educated us with the story of their development of the breeding of Heuchera over many years and the current programme of research for their team of 12 breeders which he oversees. Chuck describes the Terra Nova breeding programme. 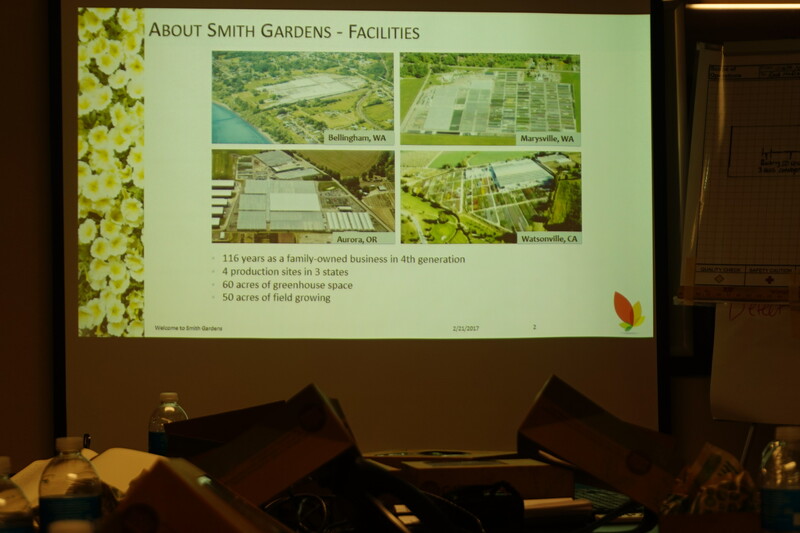 Eric Smith, Smith Gardens, was extremely generous with his time and openness in discussing with the group how the company has developed over the 116 years and four generations as well as their current thinking on business development. In addition to their development of the new 9 acre facility in Aurora, they are focusing on the production flow and how they make the best use of the automation that they are investing in as well as the resource of their labour which has an increasing cost. Visiting the plant clinic today at Oregon State University with Melodie Putnam, Maryna Serdani, Michael Gordon, Bill Thomas and the #GrowersStudyTour2017 hearing about the plant pathology research in the department. Blooming Nursery distributes much of its own produce. Travelling north again up to Cornelius OR, in the area of Portland, the group visited Blooming Nursery and spoke to the founder and proprietor, Grace Dinsdale, who has changed this farm from a family dairy operation to a high quality, perennial producer supplying the independent garden centre business in the western seaboard, as well as Idaho, Colorado and western Kentucky. Over the 36 years that she has run the business, she has developed an enviable reputation for the plants that they produce as well as an impressive production facility fitted to its purpose and a committed, skilled workforce of which she is extremely proud. Glenn, Laura, Mark and Kate showed us the nursery which is in full swing building up the stock for spring sales. 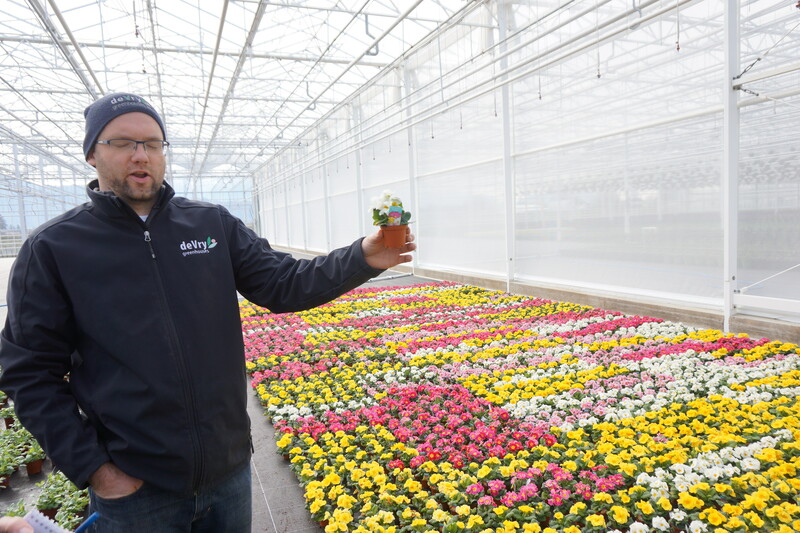 In addition to their young plant sales to local growers, they are marketing finished products to Garden Centres (60%) of their trade and the rest to larger stores. They have approximately 4 acres of production and, with the exceptoion of a small amount of seeding are entirely vegetative, taking in unrooted material from a number of producers in Central America. They are proud to be connected to the Proven Winners programme and are responsible for the sales in this area. They put less emphasis on winter crops and are empty for 2 months of the year during which they also take good care of the clean up of the greenhouses which fits in with their philosophy of a great reliance on biological methods of P&D control. The staff of 16 permanent and up to 50 seasonal, who come back each year, are able to deal with the flexible work programme as they are supported by insurance for periods of unemployment. Mark, production manager, talks about the intensive IPM programme. The nursery manager, Mark (previously a glasshouse vegetable grower), told us about their IPM programme which is intense and practically removed the need for chemical treatments. He spends a lot of time and money of the effort which has produced good results over the last year but relies on constant scouting of the crop and close attention to the development of insect populations as well as preventative predator applications. They make a virtue of the programme with their clients and explain the reasons for the presence of insect remains on plants. Minter Gardens– (Chilliwack B.C.) 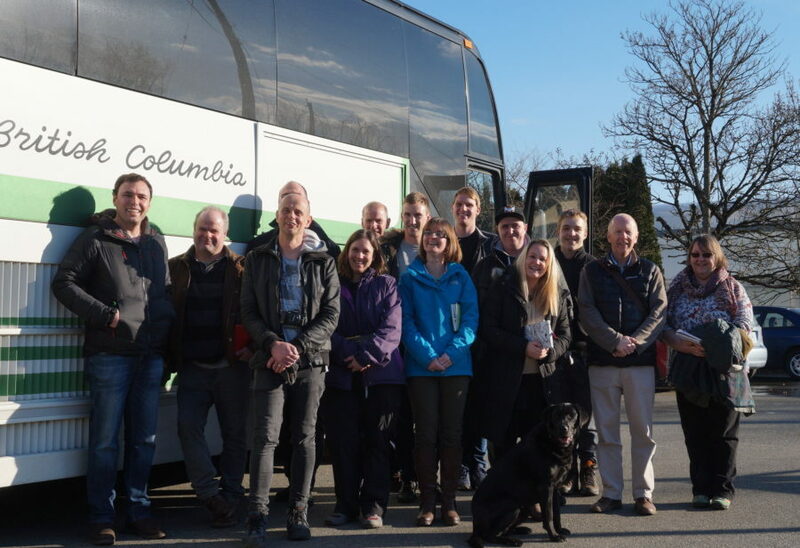 many thanks to Lisa and Brian for giving us such a good tour of the company and talking to the #GrowersStudyTour2017 about their business, the current market development and how Canadian horticulture has changed over recent years. De Vry Nurseries, (Chilliwack, BC) This is one of the largest companies in this area and is run by Piet de Vrij with his team including Rick and Brendan who gave the group a great deal of their time to see the nursery and discuss their techniques. The production in BC is augmented by another large production glasshouse in Alberta which helps them to supply chains all over the area. Due to the large distances (it’s 12 hours drive to Alberta) involved in distributing the plants, Piet joked that they were sometimes called a transport company with some greenhouses! Rick talks about a new mini primula in 7cm from Schoneveld breeding. Once again, the company focuses on young plant production with it being split 60/40 between BC and Alberta. They try very hard not to generate surplus and sell off, as other growers do, as it affects the competition with their own finished production later on. They adhere to their production plan rigidly and this helps get long range planning in to the buyers’ thinking as well. They have moved from hand sowing to pelleted see and developed a germination room. They have brought in second hand benching to improve product flow in the young plant department. They have started their own mail order sales outlet via the web. One of their largest productions is 500 acres of outdoor Thuja production for hedging, sold mainly as bare root with the later introduction of container plants to reduce wight and shipping cost. The five year crop is grown form their own cutting material and involves up to 50 people sticking cuttings. Planted out and topped in the second year and sold after 5 years normally. The group saw their large, well equipped work hall and a delivery of premixed potting soil from a local producer in Chilliwack. They were filling a range of containers of varying sizes with ease and planting bedding on lines. They bundle card to recycle and that covers cost. Plastics are packed and recycled with types 4,5 & 2 which are sent to New York for processing. Rainbow Nurseries, (Chilliwack, BC) For our last nursery visit in the area, we headed to Rainbow. The modern facility in Chilliwack is one of three (2 locally and one in Alberta) that the company has developed over 35 years, selling mainly to box stores. The production manager, Rob O’Hara has been doing the job for the firm for 19 years and has overseen many of the developments including the building of new glasshouses replacing some of the older structures (and preferred due to the lower maintenance cost and not having to recover plastic houses every 4-5 years). They have recirculating irrigation water from their new flood floors which was not a priority elsewhere as there was no statutory requirement for it and the cost of retrofitting would outweigh any cost benefit. 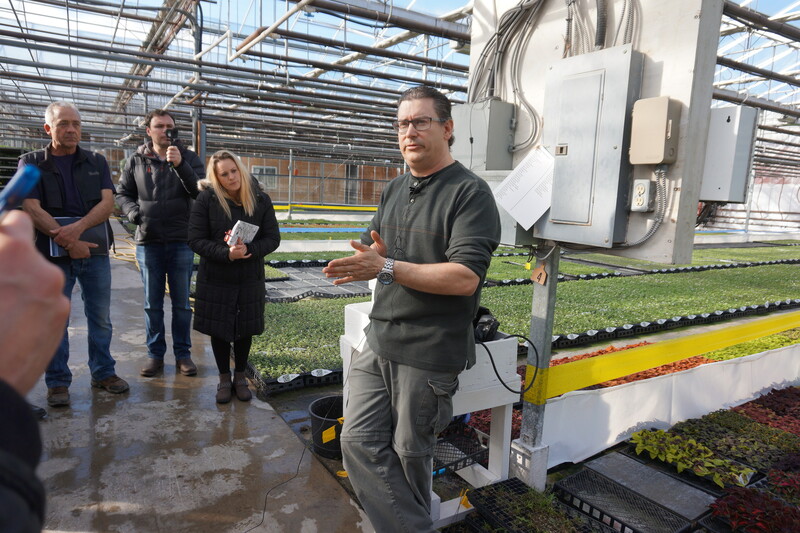 They have also installed LED lighting over (mount 5m over the crop) their young plant production, delivering 28 micromol at plant level, which Rob believes has great benefits for the type of plants and quality that they can produce. They use light sensors in the crop to control lighting levels via their computer. They also have aeropot type plug production, under licence from Dummen, and distribute some of the plugs to local growers. Their P&D programme is entirely biological in the young plant area but they will use some chemicals in finished plant production. 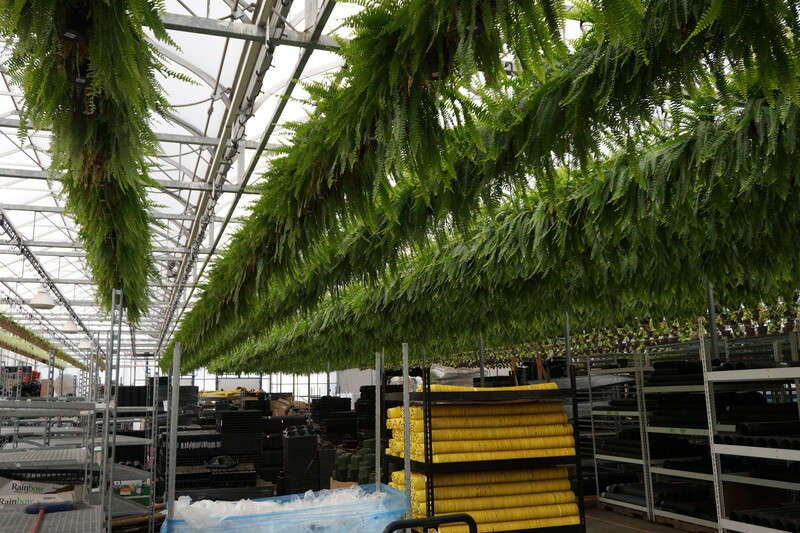 Fern production making use of space over the packing area before the bedding season. In common with other nurseries seen, they use premixed composts and these, typically, contain 10% pine chips (elsewhere composted Douglas Fir) to replace part of the peat with a cheaper local alternative. They have a very large wood burning operation which is bought and paid for; new developments would now be more economic with gas burning due to the price and low maintenance advantages.